Boom boom goes the speaker and megaboom goes its price. If you want big sound in a portable Bluetooth speaker, UE's MEGABOOM is a great place to start, especially if you have the dough to finance it. The waterproof and shockproof speaker is often a little discounted past its $299.99 MSRP, but it always hovers around the $240 mark like it is currently on Amazon. But if you don't mind getting a refurbished unit, there's a nicer deal to be had at Best Buy. It's offering a refurb UE MEGABOOM for $139.99, with 2-year warranty for parts and labor, and covered under Best Buy's Return and Exchange promise. The speaker should be restored to like-new state and come with all original accessories. 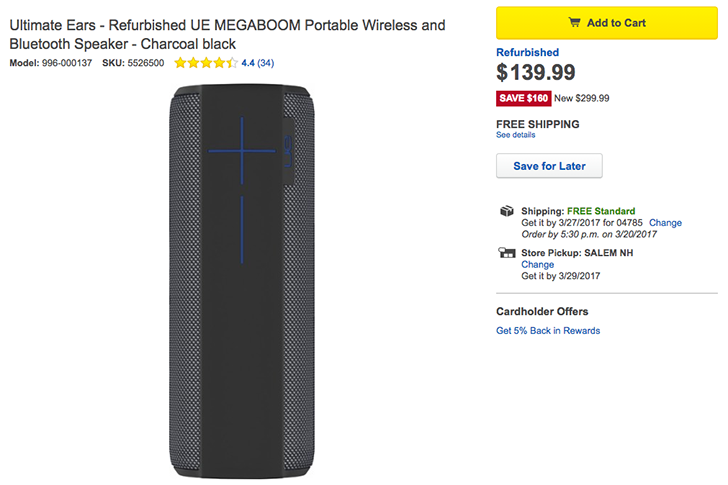 This is the lowest price we've seen on the UE MEGABOOM: the last time a refurbished model was on sale it was down to $149.99 and the same refurb unit is going for $154.90-$179.99 on Amazon now, depending on color. Only the charcoal version is discounted at Best Buy though, so you better like grayscale gadgets if you want the lower $139.99 price. Shipping is free and the link is right below if you're interested.